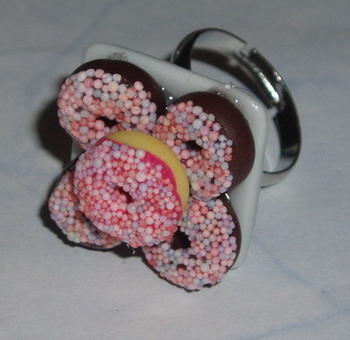 Donut Ring, Donuts with Candy Sprinkles on a 20mm porcelain Plate securely attached to an adjustable silver plated ring base. 5 miniature donuts on each plate in various flavours with micro candy sprinkles. Each Doughnut is hand made using fimo clay. Donut Ring. Handmade Donuts with Candy Sprinkles on a Plate securely attached to an adjustable silver plated base. Plate measures about 20mm across and is made of porcelain. There are 5 miniature donuts on each plate in various flavours with micro candy sprinkles. Each Doughnut is individually hand made using fimo clay.